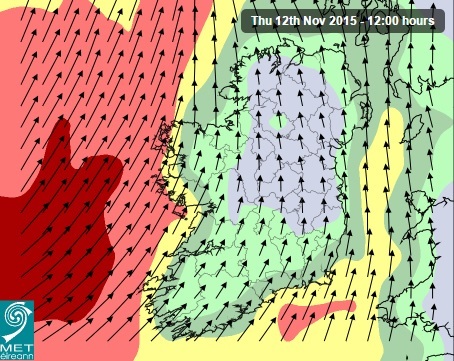 Met Eireann has issued a wind warning for western counties with damaging gusts forecast for Thursday. A status orange wind warning has been issued for Donegal, Galway, Leitrim, Mayo and Sligo. Southerly winds, later veering southwest then west, with mean speeds of 55 to 80 km/h, will gust between 100 and 120 km/h. Winds will be strongest near coastal areas, peaking Thursday evening into early Thursday night. Meanwhile, a status yellow warning has been issued for Munster, Leinster, Cavan, Monaghan and Roscommon. Southerly winds, later veering southwest then west, with mean speeds of 45 to 55 km/h, will gust between 90 and 100 km/h. Winds will be strongest near coastal areas. The Met Eireann forecast suggests the strongest of the winds will occur for northwest coastal counties, with some damaging gusts possible. According to Met Eireann, it will turn much colder on Thursday night with temperatures down to between 2 and 4 degrees despite the ongoing strong southwest winds, which will be gale force along western coasts, and possibly strong gale force to storm force along the northwest coast. There’ll be showers overnight too all along the west coast, some blowing further inland at times. They could be heavy in the northwest, falling as hail or wintry at times on the hills and mountains in Donegal. Met Eireann forecast Friday will be a cold and blustery day with widespread showers, some of hail or thunder, particularly in the west and northwest. It’ll be a much cooler day, with afternoon highs of 7 to 9 degrees and feeling significantly colder than recently in the blustery southwesterly wind. It’ll be cold for a time Friday night too, but turning milder overnight as winds back southwest to south by morning. Latest indications suggest moderate southerly winds for a time on Saturday will veer southwest again later as a spell of heavy and persistent rain extends over the country. It’ll remain on the cool side in Ulster, but milder conditions will return elsewhere, Met Eireann says. It says Sunday will see further rain and moderate to fresh, occasionally strong southwest winds, and the further outlook in to the early days of next week is for continued unsettled conditions, with occasional spells of rain.